You find yourself in a maze filled with edible orbs, and you are not alone. Monsters lurk in this place, is it a dungeon? Is it a castle? Is it a level of HELL? You must run from these evil things — oh! You catch a glimpse! They’re g-g-ghosts! Vengeful, doomed spirits chase you, wishing to devour your soul. So you run. You dodge them by darting into unused corridors! Oh god but there are more! Mindlessly being forced to eat orbs as you run in terror, you stumble upon one that causes the ghosts to flee from YOU. Ha ha! Who’s chasing whom NOW, you fiends?! You gobble them up for a few seconds, not nearly enough seconds. Then their fear is over. You didn’t kill any of them. You do not kill ghosts. The chase is on again, and again, and again until you somehow eat all of the orbs. Then it all starts over. No, I didn’t write out an entry from my Terrible Dreams journal. 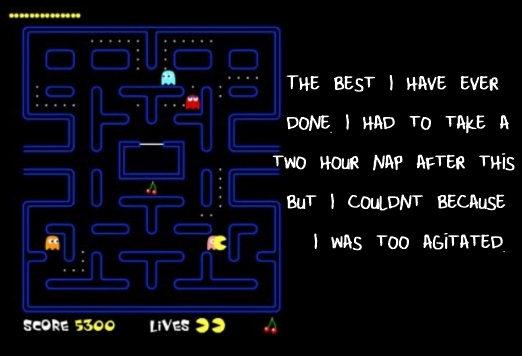 I just described the basic plot of Pac Man, an early video game from the otherwise glorious 1980s. It was released on this date in 1980, and I was never the same again. I tried my hand at this game early into my career as a game-playing child. I figured that I was a fair Donkey Kong player (I could get through a few levels before I grew bored), so I might as well see what this Pac Man was all about. Little did I know that it would contain a perfect blend of things that my young mind never wanted to experience. It, along with help from that terrifying “Perfection” (which is an article for another day), is the game that nearly ruined me when I was a youngster. It put me off of gaming forever! The chasing, the sounds, the music, the ghosts, the consuming, the repetition — they all combined to give me the worst anxiety ever experienced by a child aged four to seven. Immediately, my pulse quickened, ulcers formed, and I ran out of the room as soon as I was eaten by the first ghost, less than twenty seconds in. I hadn’t played this game for over 25 years. I hadn’t even watched any one else play it, as even observing another person trying caused me to panic. But tonight… Tonight I found a free flash version. I had one of those “self-betterment” moments where I thought that I should toughen up just in case. Just in case of anything at all, I guess. I think I started too strong, too soon. I got perhaps forty seconds in before one of those damn ghosts got me, I don’t know which one because in my terrorized state, I cannot detect things like “colors.” I screamed the entire time and shouted commands such as, “GET AWAY FROM ME, YOU AWFUL AWFUL GHOST!” My god, I am not sure if it would be any worse if I were really Pac Man and this were my reality. 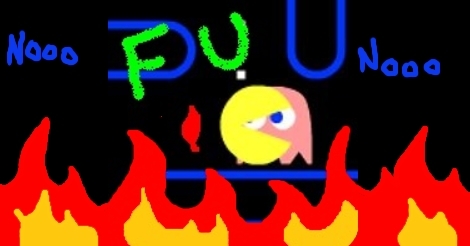 I may be the only person on earth with Pacmanphobia. 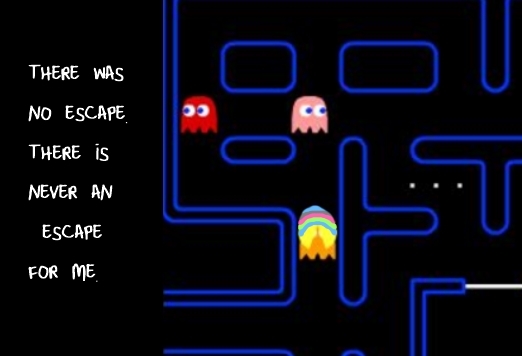 Certainly any fear I have of ghosts or the supernatural or of the possibility of an infinite array of alternate realities have all stemmed from this “game.” F U, Pacman. GTFO.